Lou and I hit ten years of marital bliss on Wednesday. In keeping with tradition we watched our wedding video on our anniversary. (Showing it this year to Josie who thought I was dressed up as a princess then declared about twenty minutes in that "This wedding thing is so boring; I am actually very bored.") Tonight we will celebrate with a fancy homemade adult dinner after bedtime, our favorite champagne and reciting on vows like we do each year. And hopefully I will find some time soon to do a full Ten Years of Marriage post (complete with wedding photos if I can find them). 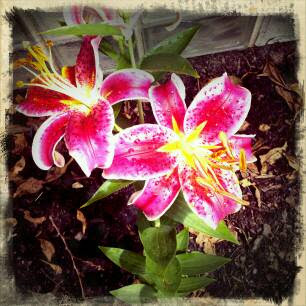 In the meantime, the stargazer lillies bloomed! On our anniversary! Funny little coincidence actually, since stargazer lillies are my favorite and Lou used to always buy them for me on our anniversary.